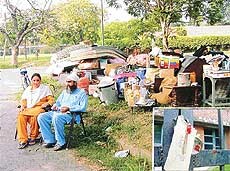 In an unprecedented move, a Professor of Punjab Agricultural University (PAU), whose services had been terminated, was forcibly evicted from his residence on the PAU campus by the PAU authorities with help of a heavy police force early this morning. Securing 11th rank in the common entrance test (CET) conducted by Punjab Technical University, Gurjeet Kaur, a plus two student of Guru Nanak Public School, has achieved the top position among the city students. It’s free for all in Mayor’s election! Thanks to the indecision of the Congress leadership and its failure to issue explicit directions to the party councillors on the Mayor’s choice, quite a few Congress councillors, have joined the bandwagon of the aspirants for coveted post. Eight persons were injured, two of them seriously, in a clash between two groups on the issue of property, at Ghaloti village yesterday. A case was today registered at Payal police station in this regard. The Chief Minister, Capt Amarinder Singh, is understood to have played down the rumblings within the District Congress Committee (DCC). The Chief Minister, who was recently told by some local leaders about the alleged anti-party activities of some of the leaders, including an MLA, is learnt to have made it clear to the complainants that such things were a routine in big organisations like the Congress. The Punjab government would set up a Banda Singh Bahadur bhavan in the city to propagate the philosophy and heroic deeds of Shaheed Bairagi Banda Singh Bahadur. Steps would also be taken to conduct a comprehensive research through renowned historians in order to correct the facts relating to the great warrior of the nation. 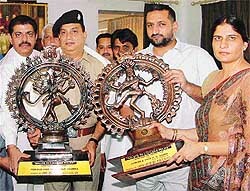 The Ludhiana SSP, Mr H.S. Sidhu today cautioned the school managements and parents in the city to educate their children besides taking safety measures to prevent incidents of child kidnapping. Destitute children up to the age of six years get nutritious mid-day meal of porridge or kitchri at the 110 anganwaris being run by the Child Development Project Office functioning under the Social Security Women and Child Development Dept. The anganwaris are divided into four circles — Jawadi, Janta Nagar, Kailash Nagar and Basti Mani Singh. There seems to be a general consensus among people over Dr A. P. J. Abdul Kalam becoming the President of the country. A survey among different sections of the society revealed that people were euphoric about his becoming the country’s President, which appears to be a foregone conclusion, particularly after the Congress announced its support for his candidature. A team of Ujjain police personnel reached here today to take away a Kashmiri youth arrested by the Khanna police on the suspicion of being a terrorist from the railway station on Wednesday. One person was injured and three vehicles including a truck and two tempos suffered minor damages when the vehicles collided with each other in a freak accident at Jalandhar bye-pass this morning. The injured person was driving a tempo. The Raikot police, on the statement of Jagtar Singh of Jalaldiwal, has registered a case under Sections 363 and 366 of the IPC against Satnam Singh of the same village on charge of abducting his minor daughter. Experts of Punjab Agricultural University have advised farmers to take special care to protect honeybee colonies from harsh summer heat. For this purpose, suitable arrangements should be made to place honeybee colonies under thick shade of trees, they said. To nurture the hidden talent of the students by making optimum use of spare time and bringing about a quantitative and qualitative all-round development in body, mind and soul, Kundan Vidya Mandir organised a summer camp for the students in computers, music, painting, dance, and sports, which concluded here today. A 10-day summer camp, full of various activities like paper craft, drawing and dance, which was organised by Tiny Tulips Playway School, concluded here today. Children of variant age groups, ranging from 4 to 14 years, participated in the camp. 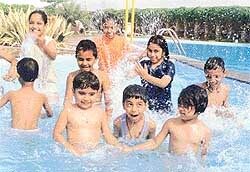 Children enjoy a splash in the pool on the concluding day of a summer camp organised by Tiny Tulips Playway School in Ludhiana on Saturday. The District Consumer Disputes Redressal Forum has quashed a demand of the Punjab State Electricity Board (PSEB) of Rs 32,921 from Mr Jeevan Ram, a resident of Santokh Nagar. The District Courts will remain closed from June 16 to July 15 for summer vacation. From June 16 to June 30, all urgent civil matters will be entertained and disposed of by Mr J.S. Chauhan, Civil Judge (Senior Division), Ludhiana, as per an order of the District and Sessions Judge, Ludhiana, Mr V.B. Handa. “Youngsters are the most vulnerable group which are falling prey to the acquired immune deficiency syndrome (AIDS) and our aim is to create awareness among them about the deadly stalker and help them make the right decisions,” said Dr Erma W. Manoncourt, Deputy Director (Programmes), UNICEF. One per cent of the Indian adult population is estimated to be infected with HIV and AIDS. Drug addiction and migration are two crucial social issues challenging the health of the industrial workers, women’s health and social equity. Kundan Vidya Mandir Senior Secondary School scored an easy win by 45 runs over the LDCA XI (B) in the sixth Chaman Lal Malhotra Cricket Cup Tournament, being organised by the Ludhiana District Cricket Association at the Arya College for Boys ground, here today.